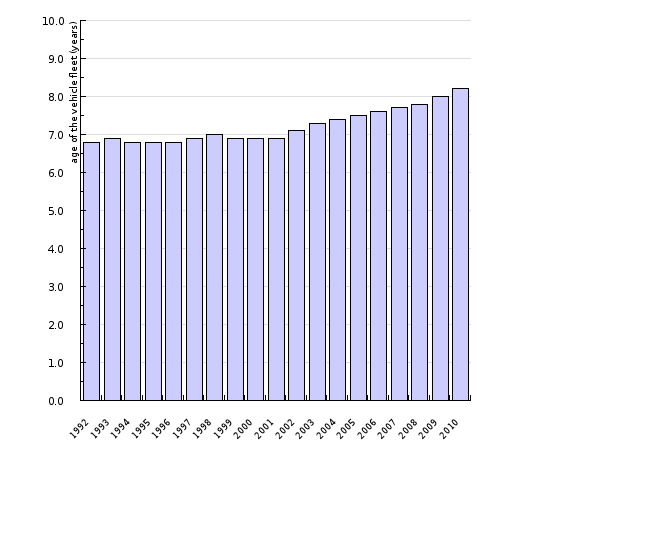 The average age of passengers cars in Slovenia increased from 6.8 years in 1992 to 8.2 years in 2010. This means that new technologies are introduced gradually and that the vehicle fleet is mostly less environmentally-friendly. The indicator shows the average age of registered passenger cars for the period 1992–2007 in Slovenia and for the period 1995–2006 in the group of selected European countries. The environmental and safety standards of vehicles are constantly improving; therefore, the new vehicles are on average less polluting, generate less noise, consume less fuel and better protect the users against accidents. The indicator of average age of passenger cars indirectly expresses their environmental efficiency. Slovenia or the EU has set no specific target for the average age of the vehicle fleet. The overall objective is to improve the fleet composition by replacing older, more polluting vehicles with newer, cleaner ones. An older vehicle fleet generates more emissions than a younger one, but more rapid vehicle replacement has the disadvantage of increasing the amounts of energy and materials used for vehicle construction, dismantling and recycling. The European Environment Agency is warning that the information on the average age of a vehicle fleet alone is not sufficient in order to assess its overall environmental performance. 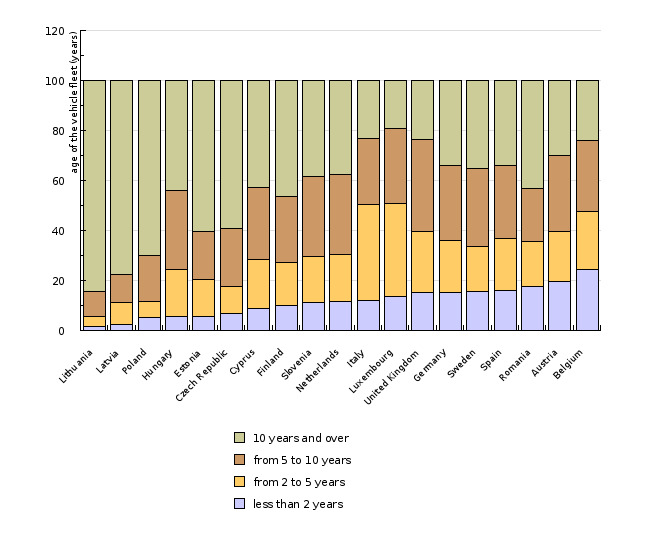 Information on the lifetime of vehicles would be helpful to complete the picture (EEA, 2007). 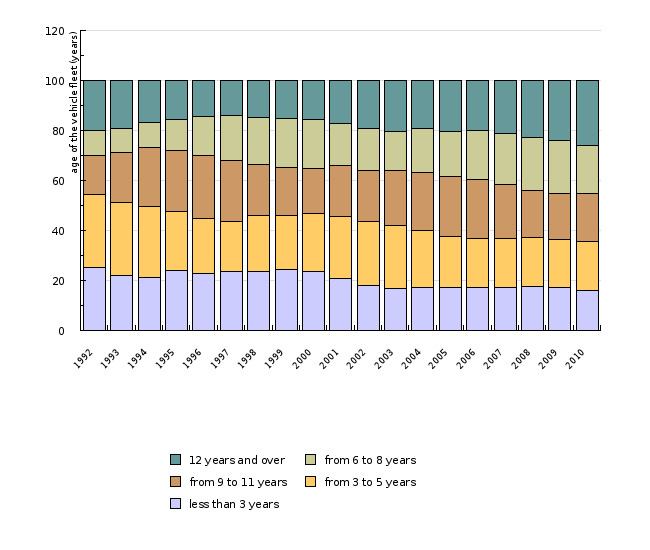 The average age of passenger cars in the EU decreased from 7.82 years in 1995 to 7.65 years in 2006. In some new EU Member States the age of passengers cars has been decreasing primarily on account of an increased GDP, accelerated abandonment of old passenger cars and the policy of encouraging the replacement of older vehicles with new ones. In Slovenia, the average age of passenger cars has increased since 2001 by almost a year (in 2001 6.9 years, and in 2007 7.7 years). This means that new technologies are introduced gradually and that the vehicle fleet is mostly less environmentally-friendly. Measures introduced by countries to renew the vehicle fleet include financial incentives for their renewal or the abandonment of old and used vehicles, management systems for used motor vehicles, import bans on some types or age of vehicles and mandatory periodic roadworthiness tests. - Member States must report to the European Union on the dismantling process. In the European Union, approximately 75 % of all vehicles are dismantled. The objective of the Directive is to increase this share to 85 % by 2006, and to 95 % by 2015 (MESP, 2006). Slovenia settled this area in 2003 with the Decree on the manner, subject of and conditions for performing public utility service of the management of end-of-life vehicles (OG RS, no. 18/2003). - of the Directive 97/24/EC for two- and three-wheeled vehicles. Regular roadworthiness tests are of major importance for the reduction of the environmental impacts of vehicles and for the timely abandonment of inappropriate vehicles. Properly maintained vehicles can be of a higher age as long as their environmental performance does not differ too much from the newest technologies (EEA, 2007). Mandatory periodic roadworthiness tests in Slovenia have been carried out for a long time, improved by measurements of exhaust gas emissions since 1st December 2003. This measure shall directly reduce GHG emissions, since cars are not allowed to exceed the approved values of these emissions. Furthermore, the measure shall also influence the maintenance of vehicles, which additionally contributes to the reduction of emissions. Methodology and frequency of data collection for the indicator: Until 2000, the indicator shows the data on the average age of passenger cars, as calculated on the basis of the Register of registered vehicles of the Ministry of the Interior. Since 2001, the Statistical Office of the Republic of Slovenia has been taking care of these calculations, publishing data annually on its web pages. Data processing methodology: The average age of passenger cars is calculated from the month and year of their first registration until the end of the observed period. - Advantages and disadvantages (at data level): Data break in 2001. - Relevance, accuracy, robustness, uncertainty: The data is considered as fairly reliable and accurate. Reliability of the indicator (archive data): The data refers to a longer time period. Methodology and frequency of data collection for the indicator: The data is annually modelled by the TREMOVE v2.50 model. Data processing methodology: Modelling of data for the vehicle fleet. Geographical coverage: EEA-21 includes 21 Member States of the European Environment Agency. The group is composed of the older EU-15 Member States (Belgium, Denmark, Germany, Greece, Spain, France, Ireland, Italy, Luxembourg, the Netherlands, Austria, Portugal, Finland, Sweden and the United Kingdom) and the Czech Republic, Hungary, Norway, Poland, Slovenia and Switzerland. - Advantages and disadvantages (at data level): Since the data is modelled rather than measured, the data must be seen and treated as estimates. - Relevance, accuracy, robustness, uncertainty: The data cannot be considered as very reliable, since the modelling results are not validated yet. - EEA, 2007. TERM 2007 33 – Average age of the vehicle fleet. Indicator fact sheet. European Environment Agency. - MESP, 2006. End-of-life vehicles. Ministry of the Environment and Spatial Planning. (17 July 2006). - Rules on devices and equipment of the vehicles in road traffic. OG RS, no. 17/2000. - Decree on the manner, subject of and conditions for performing public utility service of the management of end-of-life vehicles. OG RS, no. 18/2003.